Obverse … Crowned and armoured bust right within three lines of dots with cross in each angle. Reverse … VI. .DAL. 1604 in three lines in a dotted circle within a dotted square, trefoil in each angle. 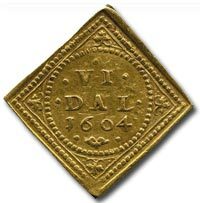 Bold very fine and extremely rare gold coin. 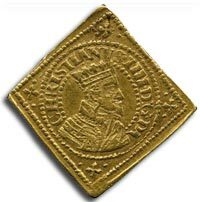 Only 425 examples of this extremely rare square gold 6-Daler Danish coin were struck and this specimen seems to be a unique die combination. Christian IV was the king of Denmark and Norway from 1588 until his death. He is sometimes referred to as Christian Firtal in Denmark and Christian Kvart or Quart in Norway. The son of Frederick II, king of Denmark and Norway, and Sofie of Mecklenburg-Schwerin, he was born at Frederiksborg castle in 1577, and succeeded to the throne on the death of his father (4 April 1588), attaining his majority on 17 August 1596. On 30 November 1597 he married Anne Catherine of Brandenburg. A daughter of Joachim Friedrich, margrave of Brandenburg and duke of Prussia. The queen died fourteen years later, after bearing Christian six children. Four years after her death the king privately wed a handsome young gentlewoman, Kirsten Munk, by whom he had twelve children, a connection which was to be disastrous for Denmark. It is believed that, counting both legitimate and illegitimate, he had at least 26 children, quite possibly more.